It’s no secret after having children, your home gets a little wear and tear, ok maybe a lot of wear and tear. As babies grow the more wear and tear there are on things like carpets, sofas, chairs, home accessories, etc. Things get spilled on, broke, knocked off, pulled down, drawn on, and more. My babies are 2 and 4 years old and still at the stage where they still have sticky fingers, spill things, and break things. While it will be a few years before I can fully redecorate to my style and taste “safely” I have been pinning things to my pinterest boards for inspiration until such a time. I have been dreaming of new sofas since the day I ordered our ugly dirty cream sofas when I was pregnant with B. I say, ugly dirty cream as they looked more golden cream in the showroom lights and under the yellow glow of our living room they look filthy when they were in fact brand new but they have worked wonders to hide stains and spills for our two toddlers up until now. While I have revamped my living room recently with lighter home accessories and some new color I have to wait until the toddlers are not wrecking the sofas anymore before I can justify getting my dream sofas to match. 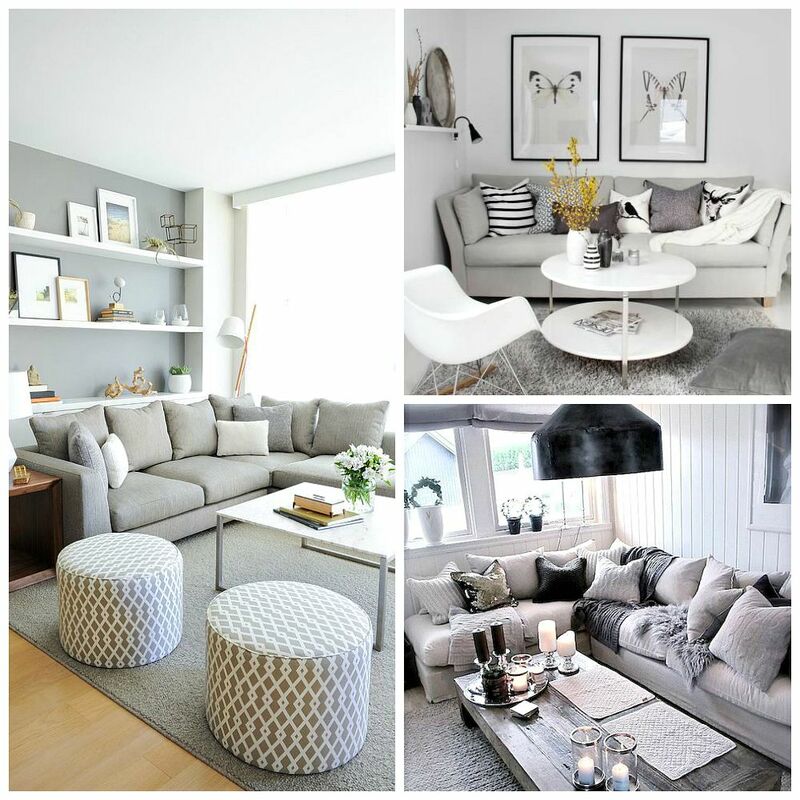 I love a light grey or white corner sofa with fluffy big throw cushions. I think it will make our living room appear bigger if we don’t have two split sofas like we do now. Give us more room to move around the room and maybe an ottoman too. I also find it so cozy at night to turn the fireplace on and snuggle up in a corner sofa with the family to watch a movie. I know there will never be a time where kids don’t ever stop be hard on furniture but I think about age six or seven they can start fully understanding where they can’t eat or drink, or have shoes on or where craft projects stay in the dining room. I love an all white, and grey theme in my home, keeping things light, fresh and the option to add color with accessories rather than staple furniture so I can continuously change the look of a room. I know I am not the only one who gets sick of one vibrant color or pattern after a while so it’s nice when it’s just a lamp shade, or a throw cushion to change instead of the color of your sofas or carpets which can be costly. I also find neutral colors like this make rooms feel bigger, brighter and allow you to focus more on a feature in the room like a color painting or a vase full of vibrant colored flowers. My house is very dark even on the brightest days and very hard to take photos inside so I am trying to bright things in that will help fix that. No one like to feel like they are in a cave all day and working from home I want it to feel fresh as much as lighter. I can’t wait for a time I can put candles, photo frames and books out on display everywhere. Where my shelves can be full of breakables safely displayed. While I am not trying to rush my children’s youth away it is nice to slowly start putting things back at a level guest can see and enjoy them. What is your ideal sofa after your kids grow up? Would you brave an all white sofa? Do you prefer large corner sofas or separate sofas on each side of the room for guests to feel comfort when they come to visit and not all snuggled up on one sofa? Would you ever brave a light colored sofa while the kids are young? In the meantime, check out my living room and sitting area ideas below. What is your favorite living room colors? Follow Let’s Talk Mommy’s board Living Room Sitting Areas on Pinterest. Oh we have very similar tastes Jenny. I love those greys and whites. I’m very much keep everything plain but add the colour in through accessories, canvas prints and cushions. I’d love, if we had a bigger house, to have a separate “grown up” living room and then a family room. In my house just now, we decided to remove all toys from the living room so it was less cluttered. Oh I love a good turquoise with grey and white. So beautiful together. Great idea. I can’t wait to share a few new room tours when I get back to the UK. Stay tuned. I too hate our sofas. They’re so big & dark & they no longer suit the shape of the room after the extension. Like you I’m making them last another few years before I replace them – when the kids are older & more able to take care of them!